I was fairly excited for the release of this graphic novel. I had previously read the first volume of Dark Horse Comics’ Aliens omnibus, which I thought was compelling material. It was easily better than Alien3 (1992) and Alien: Resurrection (1997), and came close to the quality of Alien (1979) and Aliens (1986). So I had the distinct impression that Dark Horse’s Aliens comics were of a higher quality than most tie-in comics. 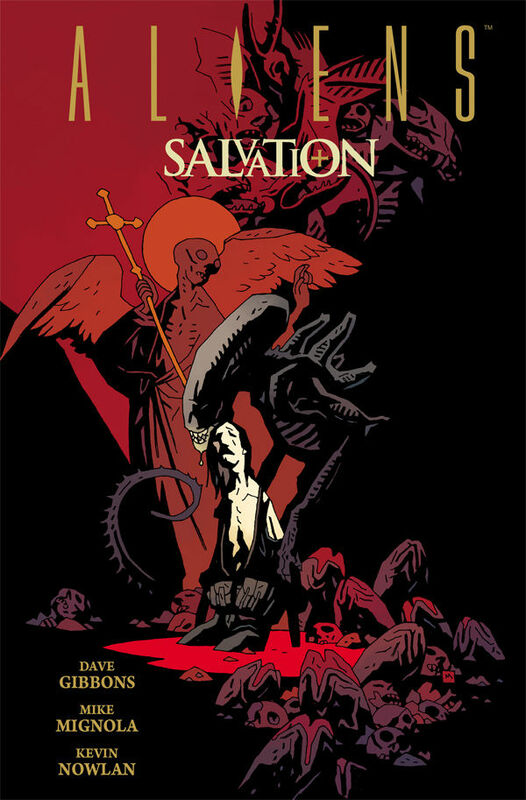 While that is true, Aliens: Salvation doesn’t reach the storytelling highs of the initial comics trilogy, published in the omnibus; but with Mike Mignola illustrating and the interesting theme of interpreting the Alien mythology through Christianity, Salvation is a fun read that should satisfy and entertain most comics readers. 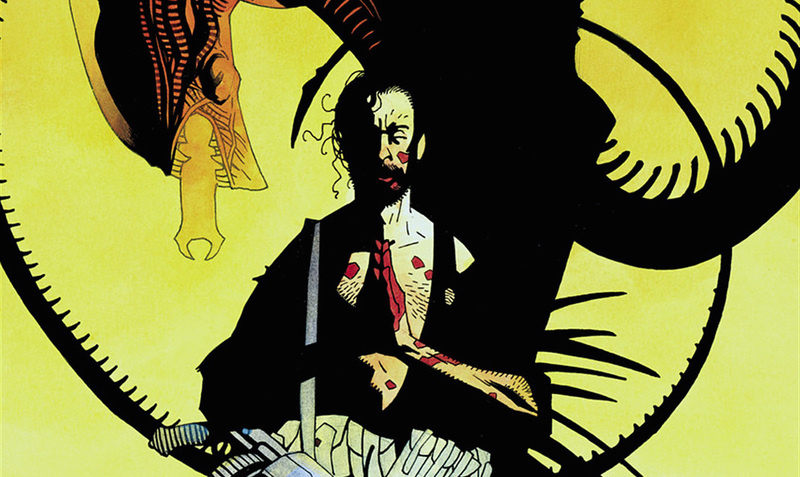 Selkirk’s Christianity makes him a unique, complex character within the Aliens mythos. Dave Gibbons is on writing duty here, and his story, while rather conventional for the Alien franchise (lone hero versus waves and waves of aliens), does provide some interesting re-interpretation of said franchise. By framing everything with the main character’s search for religious salvation, and believing that he has been sent by god to destroy the aliens, Gibbons casts the Aliens franchise into the realm of the classic gothic. It’s an interesting way of viewing the franchise, and adds a lot of psychological complexity to the main character, Selkirk. Outside of this framing device, though, the story is rather standard for an Aliens comic. Selkirk’s christianity recasts the science-fiction horror of Aliens into the classic gothic. But Dave Gibbons isn’t why I bought this. Rather, it’s the idea of Mike Mignola illustrating Aliens. 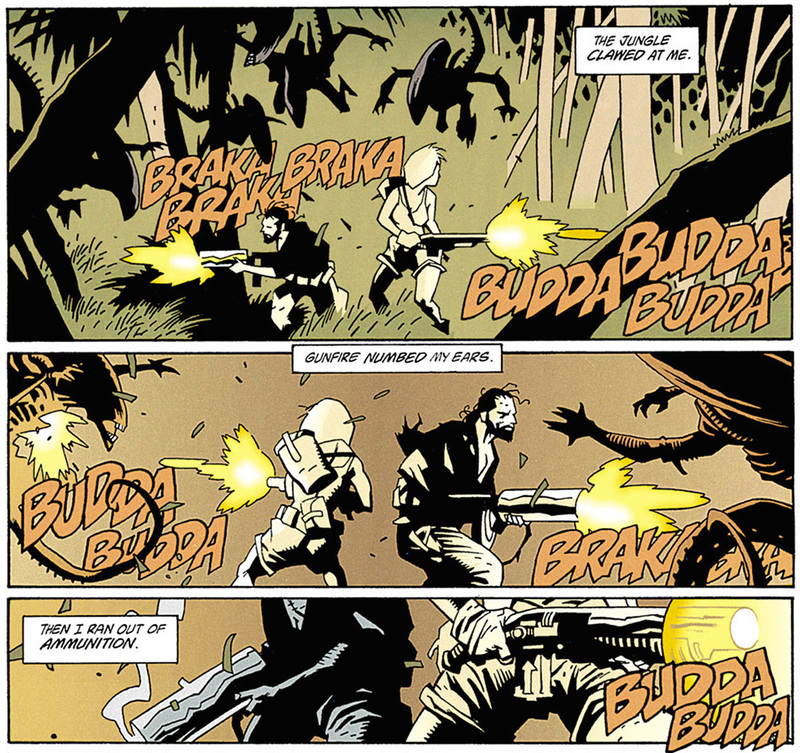 Those films are probably the closest that cinema has come to depicting Mignola’s inky black style, and whilst this is done in some scenes in the comic, the story deprives the opportunity of that claustrophobia that the films had by setting it almost entirely in a jungle. Still, it’s great to see Mignola illustrate these scenes, and he handles the look of the aliens better than any other comic artist I’ve seen. As always his figure work is wonderful, and his unique style of illustration is always a pleasure to see. 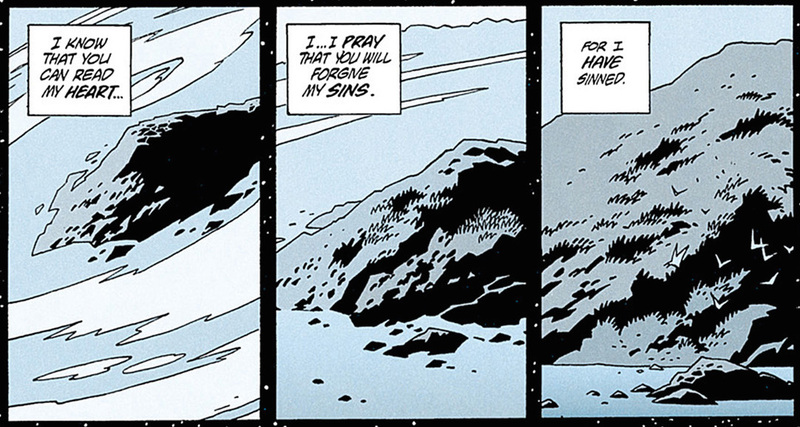 Mignola’s work is the real reason to read Aliens: Salvation; no one draws like he does. 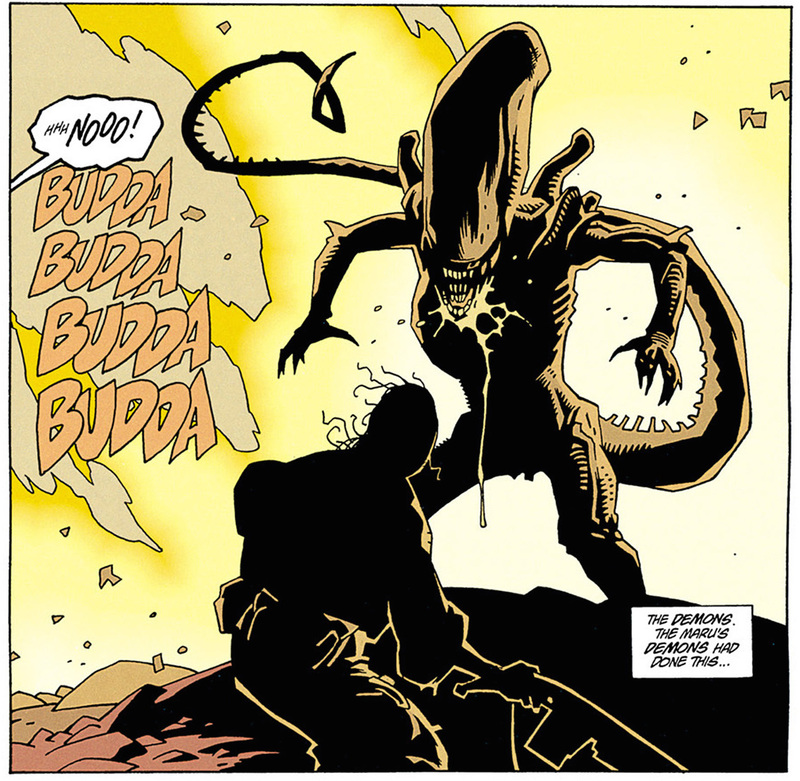 Seeing Mike Mignola render the iconic aliens is the main draw of the comic. As for the graphic novel itself, I was very slightly disappointed with the production. For just under £9.00 new you can’t really complain, but I wish Dark Horse had spent time remastering the pages. On quite a few pages the colouring isn’t quite what it should be; it’s never terrible, but it lacks the definition that I’m sure the artists wanted. It looks a bit fuzzy, almost as if Dark Horse had used low-quality images to print. It’s only a small nitpick though; for the most part the printing is good, and having it printed on thick, high-quality paper is great. Likewise, the title design and the new cover, illustrated by Mignola, are wonderful. It’s a nice looking book, in hardcover, and under £9.00. You can’t really complain about that! 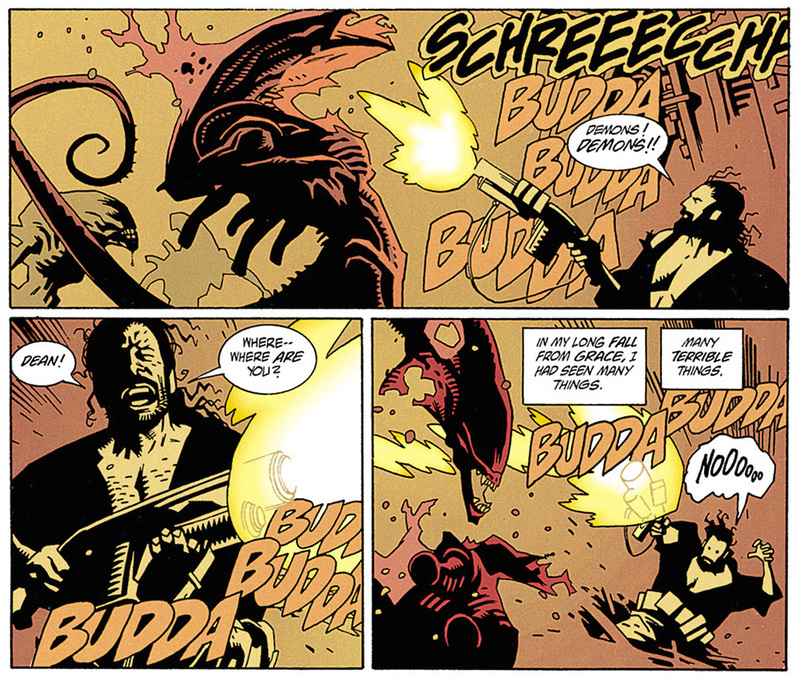 Aliens: Salvation is your standard man vs. alien story, although beautifully illustrated by Mike Mignola. Aliens: Salvation is a great way to spend an hour or two on a lazy afternoon (it’s a short read!). Gibbon’s script is interesting and thoughtful but ultimately a standard Aliens outing; don’t come to this looking for anything outside of what the franchise traditionally offers. Mike Mignola’s artwork makes the graphic novel well worth your time though, with his signature style well-matched with the franchise. The hardcover is a nice copy, even if the printing isn’t amazing, Worth a read for fans of the franchise, and for those dedicated to reading everything Mignola, the book is an interesting minor work of his.